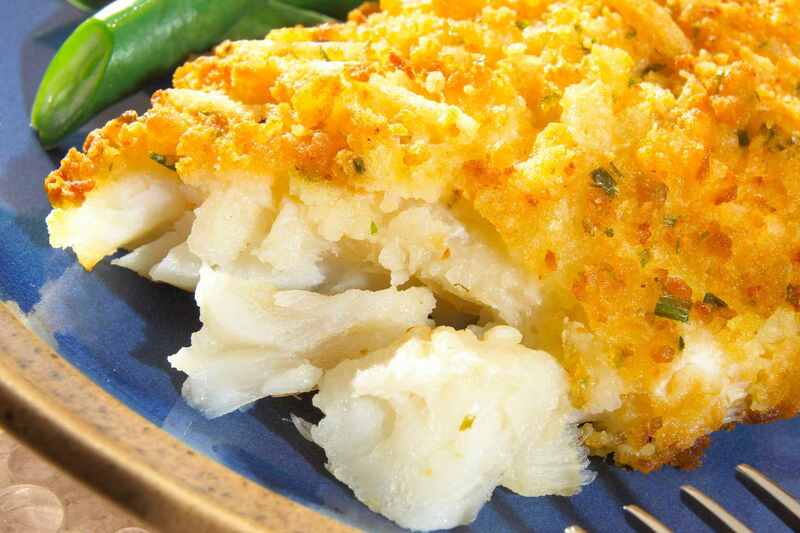 Mild cod gets brushed with Dijon mustard, then topped with crushed cornflakes in this quick and easy fish recipe the whole family will enjoy. There's nothing like Old Bay seasoning to wake up a fish dish. And it really delivers something special to these salmon patties. You can use either canned salmon, leftover cooked salmon or the salmon in airtight pouches (no bones) for these patties. The first time I made this dish, my kids were having friends over for dinner. I worried for a minute that this might be too far afield from the typical chicken tenders and mac and cheese the kids might be accustomed to eating at home. Boy was I wrong! They loved the crushed potato chip coating and wolfed down this fish in a flash! Why go out for fish tacos when it's so easy to make them at home? Although this recipe calls for mahi-mahi, you can use any kind of firm, white fish - just choose whatever's on sale. And if you're in a hurry, use a store-bought mango or peach salsa instead of the cabbage slaw. The lemon butter sauce has just the right amount of zing to make this recipe stand out from the pack. But it's really simple to prepare. When you fry fish at home at the proper temperature, it doesn't retain much fat, and it tastes amazing. And don't worry about the beer for the kids - it cooks out. This recipe is a keeper - try it, and let me know what you think. Post a review. I know, I know. This recipe sounds all grown up and gourmet. But trust me, kids really enjoy the crunch of the pecans and the tang of the honey mustard in this salmon recipe. Serve over couscous or rice. What would a list of fish recipes for kids be without a recipe for tuna casserole? This version uses cream of broccoli soup and gets a kick of pizzazz from Old Bay seasoning. The crunchy potato chip topping is always a hit with the kids. Frozen shrimp scampi makes this dish a breeze to prepare. Choose russet or yukon gold potatoes for this recipe. This super simple fish bake recipe uses nice white fish and is packed with healthy spinach!